Patagonia’s Dual Point Alpine Pants are the ultimate example of versatility, made with alpine climbing, touring and skiing in mind. 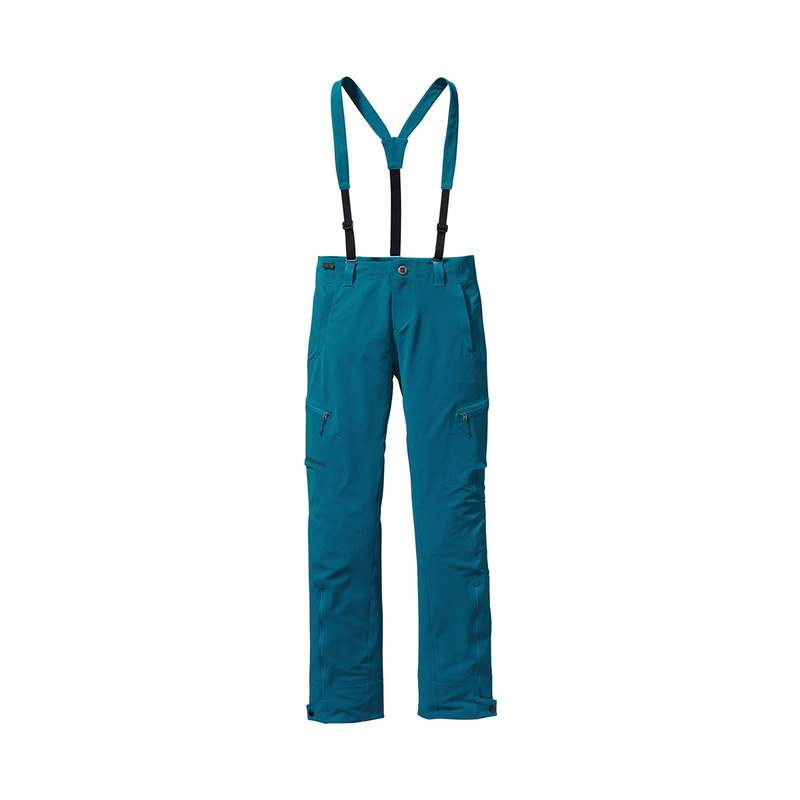 They feature an inner, adjustable boot gaiter, as well as lace-hooks and a calf length, watertight zips for compatibility with both ski boots and alpine boots. Made from a mid-weight mixture of polyester and spandex, they are stretchy and easy to move in, as well as water-resistant. Other features include hand pockets, as well as harness compatible, zippered thigh pockets and an extra loop under the rear belt loop which attaches to the snow skirt of any Patagonia snow jacket. Finally, an easily adjustable waistband and removable suspenders make sure you're super secure all day. The DWR (Durable Water Repellent) finish has become almost ubiquitous in the outdoor industry, and the satisfying water beading it provides has become the hallmark of a beautiful jacket. It is not strictly waterproof but will provide protection on it’s own against a light shower; however it does wear off so needs to be topped up from time to time. The DWR stops water from soaking into the outer layer of waterproof fabrics like Gore-Tex, meaning they remain breathable and light in even in heavy rain. Patagonia offer an ‘Ironclad Warranty’ which means if you’re dissatisfied with the performance of a product at the time of purchase or afterwards, or if it breaks unexpectedly, they will provide a free exchange, refund or repair. They will also repair damage from wear and tear for a reasonable price, and have a section of their website that shows you to repair your own clothing, so there’s no need to unnecessarily buy new gear. Right from the start, Patagonia has been at the forefront of environmentally friendly production, and are still one of the only companies in the world that offer a completely transparent supply chain to anyone who cares to look. They are constantly experimenting and developing new ways to bring us durable and sustainably produced clothing - recycled polyester, organic cotton, traceable down, responsibly sourced merino and undyed cashmere are all common materials in the Patagonia catalogue. As well as using the best materials and production methods for the planet, Patagonia also make sure every one of their employees is treated fairly, from the shop floor to factories all over the world. And they donate a percentage of their yearly profits to environmental initiatives and community projects in many different countries.